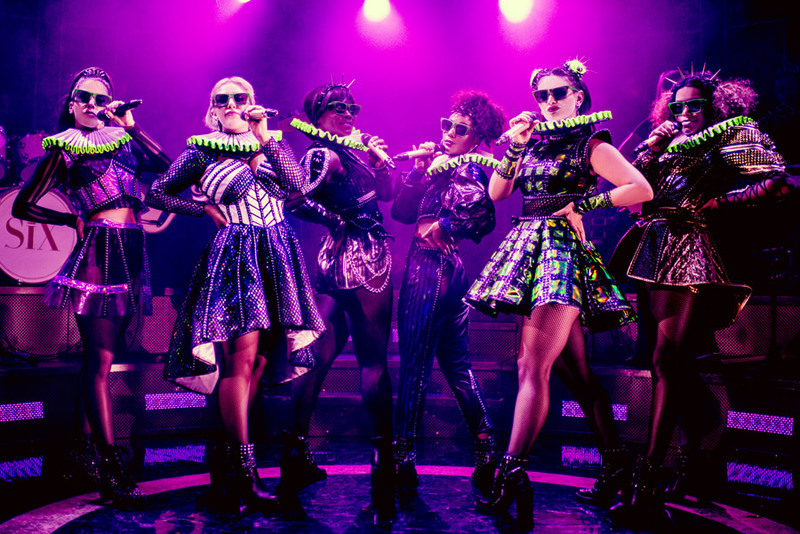 Douglas Mayo takes a look at Six the musical at the Arts Theatre, London concluding that Six is a ten! It’s great to know that new British composers are out there developing ideas for new musicals. Whereas many would have gone with a lavish rich score, Toby Marlow and Lucy Moss have combined to write a compact, ridiculously tuneful, funny and yet also a heart-felt cycle of songs that bring these incredible characters into a modern idiom. Imagine if the Spice Girls had been around in Tudor England and you’ve begun to scratch the surface. Six is really the little musical with a whole lot of talent. Playing the wives of Henry VIII are Jameia Richard-Noel (Aragon), Millie O’Connell (Boleyn), Natalie Paris (Jane Seymour), Alexia McIntosh (Cleves), Aimie Atkinson (Howard), and Maiya Quansah-Breed (Parr). Between them, is enough vocal prowess and on-stage charisma to power several big musicals. Six the musical brings this amazing talent together to create an incredible ensemble which re-enforces the show’s overall message. Don’t think you headed into an epic like Les Miserables. At just 75 minutes long this felt very much like a musical for the social media generation. It packs a wallop into a short space, no padding allowed. It is to the credit of the writers and producers that they resisted suggestions to extend it into a proper musical. Six is something quite unique and it works because there is real truth in these amazing women and the message is pure and undiluted. Besides you can see Six, go for a lovely meal after and till be home before the Les Miserable crowd and on a weeknight that can be a great thing. Bravo to Directors Lucy Moss and Jamie Armitage, Choreographer Carrie-Anne Ingrouille, Set Designer Emma Bailey, Costume Designer Gabriella Slade, Sound Designer Paul Gatehouse and Lighting Designer Tim Deiling. Six’s physical staging matches its compact yet powerful score. There’s no need for anything too grand here. Every element perfectly adds and enhances the whole. It’s interesting to note that one of the new breed of British musicals is far from “mega” in size but certainly seems “mega” in the response to it so far. The smaller Arts Theatre gives the show a close up intimate feel and the show bursts off the stage. William Finn’s Falsettos once proclaimed their show band the “Teeny Tiny Band” but with just four musicians under the direction of Musical Supervisor Joe Beighton and Musical Director Katy Richardson, the Six band really and truly rock the house. Arlene McNaught, Alice Angliss, Amy Shaw and Terri De Marco had me totally convinced throughout that more musicians were masked offstage but I was wrong. Sublime musicianship combined with an understanding of the onstage nature of the gig, almost sets the band up to become the courtiers for these Queens. 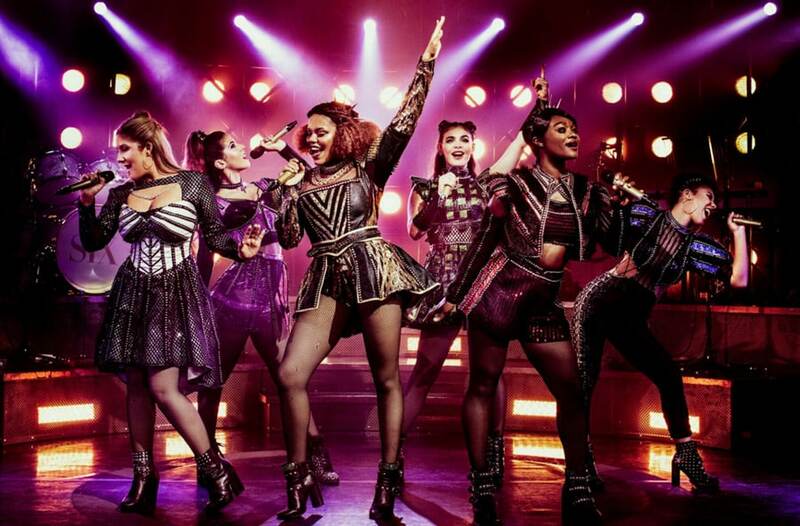 This week producers announced that Six the musical would open in Chicago soon. I don’t quite think Downton Abbey has quite prepared them for Tudor Queens quite like these ladies. With the run at the Arts Theatre now booking to January 2020, Six joins Everybody’s Talking About Jamie bringing British musicals back to stages around the world. To have received an Olivier nomination naming six leading ladies together gives you an idea of just how special this is. What are you waiting for? Get a ticket for Six the musical NOW!